Sports Illustrated‘s special issue, “Football America” (Dec. 4, 2006). 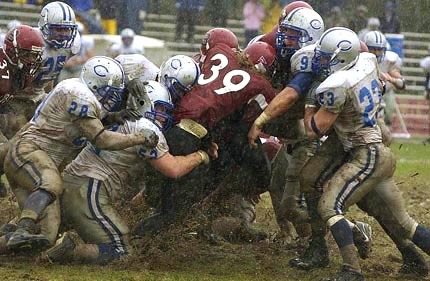 The photograph, featured across pages 46 and 47, shows Jamie Walker moving a pile of Mule defenders, one of his 43 carries on the day, just two shy of his own Bates single-game record.The good: Daryn Slover, a staff photographer for the Sun-Journal newspaper on freelance assignment for the Bates Office of Communications and Media Relations, persevered despite the wind and rain, only calling it quits after several lenses became too wet to work. He shot this image about two hours into the game. The following Monday morning, the Communications office offered the photograph to the Sports Illustrated photo editors. The bad: The weather, as some 4.62 inches of rain fell on Oct. 28, including 2 inches during the three-hour and 15-minute contest, resulting in a flood warning being issued for the nearby Androscoggin River the next day. The wind blew from the southeast at 20 to 30 mph all afternoon, and despite the look of the photograph, the main obstacles on Garcelon Field were huge puddles, not mud. The ugly: The ending, at least from the Bobcat perspective, with Colby winning the four-overtime contest with Brian Bachow’s 22-yard field goal, giving the Mules a 10-7 win.